Getting crafty at home couldn’t be easier and inexpensive with this DIY trash bag spider web window shading decoration project, as seen on HGTV ! Perfect to lay over rollershades (as seen in the photo below) or any window treatment(s) for indoor or outdoor festivities! Let’s get started trimming trash bags! Start by laying a trash bag out flat. Trim off the sides and bottom so you’re left with two big rectangles of plastic. Cut each piece into an approximate square (eyeballing it is fine). Fold one of the squares in half diagonally to form a triangle. Fold that triangle in half two more times. This is slippery stuff, so use a few pieces of tape to fasten the layers together on the loose side. It will help hold the shape together when you’re cutting. 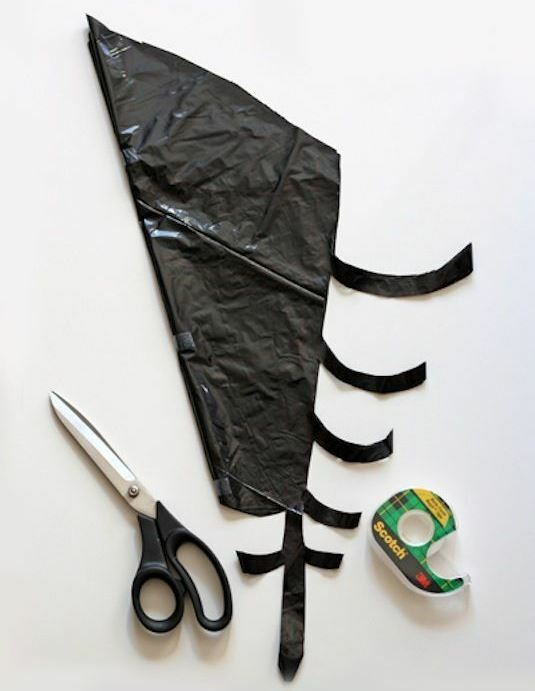 If any of your tape pieces end up on the web itself after you’ve cut it out, remove them before unfolding. The illustration above is very helpful! I hope you enjoyed this project! If you liked this post and want to see more like it, you can also follow us on Pinterest!